August 15, 2008 by KimmChi in "crafting with kids"
And if your looking for something crafty to do with kids this weekend in New York city, check out the Nature Crafts at Prospect park on Flatbush Ave. at Eastern Pkwy. in Brooklyn, every Saturday and Sunday from 1 to 3pm at the Audubon Center. Staff lead informal drop in craft sessions for kids using all natural materials. 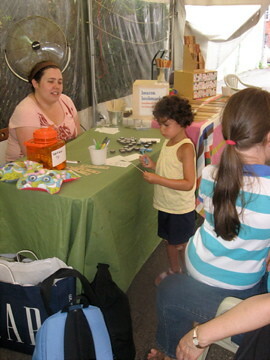 Saturday in Bryant Park is the Camp Klutz Craft Bonanza from 12 to 1pm with all sorts of crafting things planned. And on Wednesday night from 6 to 7.30, in McCarren Park, The Brooklyn Children’s Museum‘s will be hosting an American Indian Night with free kids hour with crafting dream catchers and singers! And if you are in to planning in advance - September 25 at Shea Stadium is hosting Stitch N Pitch (catchy isn't it!) a day at the park to knit, crochet, embroider, cross-stitch and needlepoint, with experts on hand to help teach the young ones - raising awareness for the Needle Arts Mentoring Program. Do you have any other tips for city activities with kids?